Easier said than done, and I debated with myself tirelessly whether I should write this post or not. It’s not easy to open up when you have been going through mental health issues but I wanted to do this as part of my therapy and to help others to try and get through similar difficulties. I have been dealing with a form of mental health called emotional distress, emotional distress can be caused by various reasons such as personal, family or work. For me, I have been dealing with a childhood trauma, which over the years up until May 2016 (last year) resurfaced in the most unexpected way, bereavement. It has led me to this position now where I’ll admit I am in need of some professional help. At first, I was very hesitant I would need any professional support, uncertain whether it was something I thought was necessary. I thought I was coping well. Friends, colleagues and family all saw me in a good light, I guess it is easy to hide it when work is so busy and it actually helps with not thinking about my issues. Looking at this retrospectively, I wish I took a more proactive approach and took a step or two back from work to work on myself. Not thinking about myself. Not putting myself as priority number 1 was not helping me get over my issues. I very much enjoy my job, i found it to be a pleasant distraction, but even in a job like that you still need to take a step back and dedicate some time to working on yourself. I needed to try and channel my thoughts to the forefront. Not accepting them. Not dealing with them is potentially going to make things worse and it did. How did I know the time was right to seek help? For me, I started to feel unwell, to a point where I couldn’t work, tension headaches lasted more than a week, not ideal when you look at a computer screen for 10 hours a day. Energy levels depleting and tiredness caused by depression, at first I thought something physically was wrong so I got myself checked out at the Doctors. When something started to really effect my life physically, it dawned on me to get myself checked over. Mentally, I think it was always apparent but I believe I was putting this to the back of my mind, not accepting it was happening, my body needed to let me know in a different way and it came out physically for me, to a point where working and home life was becoming a struggle. When these symptons started to develop plus others such as anxiety, I knew it was time to face the fact that seeking professional help is something I have to try. I have never had counselling before, I have found it hard to admit this is something I might of needed in the past, I am afraid people might see me in a bad light, think I’m weird, crazy even, and people won’t want to associate themselves with me, and as a professional in the software development industry it is even more important that I maintain a positive image. So far everyone I have told have been super supportive, opening up has been the best decision I have made since deciding to propose to my now fiancé. It has surprised me how supportive and understanding everyone has been, I didn’t expect this at all, not many people talk about mental health issues, it’s not a common subject, but it should be, so many of us will go through moments in our lives where mental health becomes an issue. My message today is you are not alone. open up, acknowledge what you are going through, talk about your emotions, cry, seek the help you need and most important don’t be afraid. The long awaited replacement for Unity’s now legacy Movie Texture is here and comes in the form of a newly written Video Playback solution. This post will tell you all about it, how to use it, what features it contains and some general tips and tricks. If you have any questions which aren’t answered in this post feel free to write in the comments section and I’ll get back to you asap. The Video Player is a new component that you add to game objects for movie playback in your scene. The Video Player will use the native video hardware capabilities of both the editor and target platforms. The component also contains a Render Mode property where currently there are five options, but perhaps some of the more exciting options is the ability to render a video through a Material Override option as well as a Render Texture. Shaders are incredibly powerful scripts and empower us to render things in interesting ways, it’s awesome we can apply custom shaders to the Video Player, opens up for some interesting possibilities. The Video Player component aims at using h.264 and VP8 for hardware which are supported on a wide variety of platforms. On the audio side we have AAC and Vorbis. If you are looking for the alpha channel to be respected within a movie clip you need to utilise ProRes 4444 which is a lossy video compression format developed by Apple Inc.
A slight complication comes with Audio here which I felt was worth mentioning; On OS X which has the most desirable workflow at present (arguably), you can chose the Audio Output Mode to be Direct, what this does is play back the Audio which is already embedded from within the movie clip. On Windows Direct Audio Output Mode does not work as it is only supported on Apple platforms, for OS X and iOS you are okay but non-Apple platforms you need to revert to the Audio Source option, this allows you to define the Audio file you want to have play back with the video. Since both the Movie clip and Audio clip are decoded from the same stream we shouldn’t see any issues with synchronisation. What I’ve learnt demoing VR to first timers. Those who have the privilege of owning a Virtual Reality (VR) headset I’m sure has shown VR to someone who hasn’t experienced it before, I like to tag these people as VR first timers (jokes), I don’t actually like labelling things but for the sake of this post I will use it. Anyway back to the subject at hand. I own a HTC Vive and it’s currently set up in my spare bedroom at home, I feel very privileged to own this hardware and to actually have a PC that runs it. I take advantage of this by allowing anyone to have a go on my VR rig. Most of my family and friends have never heard of VR, they aren’t exactly geeky tech heads like myself, one of my friends thought it was some weird spy camera rig set up, having described that it’s the next big thing called Virtual Reality, my friend still didn’t get it and just brushed it off, I even had to plea with him just to give it a go, I was begging him to try it to see…I had a similar experience with my girlfriend as well. I have demoed VR to a lot of people at various technology conferences, typically at a Unity booth at a conference we would have some form of VR demo set up, whether it’s an Oculus VR, HTC Vive or GearVR. The advantage at a technology conference is I don’t have to beg people to try it. What’s the different between the three? Quite drastic in my opinion and this question is relevant to the topic of this post because you need to think about what type of VR experience you would like to show to a VR first timer. 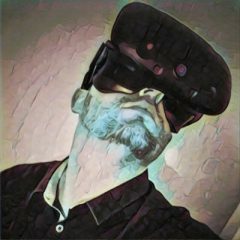 I don’t want to delve into this question too much though but in simple terms Oculus is a sitting or standing VR experience connected to a PC, GearVR is a mobile experience, a device that has a slot to place your Samsung device into and the HTC Vive (saving the best ’till last) which is a room-scale VR headset connected to a PC (can also be a standing or sitting experience). GearVR has probably been the most accessible VR experience available on the market at present, given there’s some hundreds of millions of Samsung devices in the hands of consumers that are VR ready puts Oculus and Samsung in very powerful position, I personally believe in using the highest quality experience for showing VR to newbies, so that leaves Oculus and HTC Vive. In my experience demoing a mobile level quality VR demo to VR first timers hasn’t delivered the same experiences as other VR headsets, I would love to hear if someone has seen the opposite experience so please comment on this post below. Let’s start with Oculus, Oculus delivers a higher level immersion, from my experience demoing to consumers, reactions to the Oculus have been along the lines of higher quality graphics, better immersion, this is partly due to the technology which in turn allows developers to push the barriers of immersive experiences. Considering Oculus runs off a high-end PC and not a mobile device (same for the HTC Vive). I’m not saying GearVR apps can not create high levels of immersive experiences…Immersion is not defined by graphics quality and or technology but it can help. Moving on to the HTC Vive, In my opinion and from my experience demoing to VR first timers and talking to professional developers, the HTC Vive delivers the best VR experience on the market. Partly due to the room-scale features it offers, this is a complete game changer in a VR experience, being able to physically move around the virtual room or space you are experiencing is extremely powerful and is a superb feature for us developers to experiment with with new game designs. What’s really strange is the ability to move around a virtual room seems to confuse consumers at first, almost every VR first timer who tried the HTC Vive didn’t think about walking around the room, it seems to come across as an unnatural thing to do, which is true, think about it; Almost all core gaming experiences are static, since the beginning of video games you have never had the opportunity to physically move around a virtual space to effect the gameplay, the Wii was really the first global success in doing physical movement to effect gameplay (is there a term for that?) but you were limited as you had to face towards the TV. Content on the HTC Vive has introduced various input designs that allow you to traverse virtual environments in various ways, there has been a few talks on this and is a constant topic at present, many developers experimenting with new ideas and also defining input standards within VR. Teleportation is one common technique which doesn’t really work for all experiences, the ability to teleport already defines the genre of your game, I mean..surely your game has some sci-fi based advancements right? As teleportation is not a natural experience for a human, the power of teleportation can break the immersive experience you are having within the content. In a general positive VR empowers you to experience what a teleportation might feel like, in reality it’s a win win situation for a consumer. From a VR first timer perspective the teleportation technique completely freaks people out at first, I tend to show VR first timers Valve’s demo called “Aperture Robot Repair” which has a cool teleportation implementation, but it takes a few times to get used it at first, especially amusing is when the first time they use it and mess it up by teleporting up against a wall it strikes shock. Other implementations involve various techniques which I won’t go into in this post. My brother tried a VR experience which placed the player up on a high beam, this totally freaked him out, having a fear of heights didn’t help but for my amusement seeing him try and balance himself on a flat surface (i.e. the bedroom floor) was rather good. So, moving on from this, I would highly recommend showing VR first timers the HTC Vive, it really delivers the best experience VR can currently offer, the room-scale capabilities enhance the experience tenfold. A cinematic experience which introduces VR first timers to room-scale VR with no interaction required, limiting the senses and allows us to adapt to the virtual environment and power of room-scale VR. Everyone I have shown this to has been blown away by this experience, especially when a big whale swims by. Generally people are super convinced at this point. Adding an extra layer into the room-scale VR experience with the ability to be able to interact with objects in a virtual room, the human senses are going a bit more crazy with this experience, usually receive a lot of nervous laughter and “whoa! !” outbursts. Introduces teleportation input technique, which freaks people out at first. Generally; feedback has been very positive with this experience. An artistic VR experience, empowering the user to be creative with painting and drawing in VR, user can move around and interact via painting strokes or objects into a virtual space. Usually at this point a majority of users have adapted to a VR room-scale experience and everything is starting to feel more natural. As far as I know there’s no teleportation technique implemented. I acknowledge content and peoples interests plays a big part in personal VR experiences and notice I mentioned “personal”, from what I’ve seen everyone’s VR experience is unique and personal, people react to different experiences differently, it can effect them emotionally, such as being excited, nervous, funny, scared, peaceful etc…it would be great to hear what content you like to show to VR first timers and also the reactions from these experiences you’ve seen, please comment below. Notice I haven’t covered nausea in this post, content on the HTC Vive and the technology shouldn’t cause this but may be experienced with specific people, I haven’t had one person experience nausea with the HTC Vive but I’m sure someone out there has.